Legion will bring with it new helms that have the same effect as Cursed Vision of Sargeras, a Leather helm that drops from Illidan Stormrage, the final boss in Black Temple. Like Cursed Vision of Sargeras, these items will have an "On-Use" ability that allows the tracking of Demon mobs on the minimap. The are a reward from completing the quest Destiny Unfulfilled, which is part of the major Legion lore storyline (and involved elements of Illidan's past). For those interested in the blindfold appearance of Cursed Vision of Sargeras, its notable that the ONLY other blindfold in-game will be the new Demon Hunter legendary Raddon's Cascading Eyes. Hence the blindfold appearance is not available as transmog for cloth, mail or plate wearers. Below is a list of the new helms coming in Legion that will allow Demon tracking. To reiterate, they DO NOT share an model with Cursed Vision of Sargeras, just the effect. They are all item level 840. For comparison, Tier 19 Normal mode gear will be item level 850. Is there a robe that has the same color pattern? 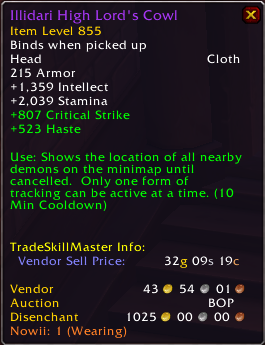 I was hoping that the use ability on this item would enable you to expose hidden demons like for example Lord Adder in Dalaran.